I’m not usually a procrastinator, but blogging seems to have brought on a severe case of it. The longer the time between posts, the greater the guilt and the more likely I am to procrastinate more. So I’m just going to bite the bullet and start blogging again. I’ve had a busy year. I spent the dark snowy days last winter in my studio with my nose to the grindstone, preparing for a one woman show at RiverArts, a gallery in Morrisville, Vermont. 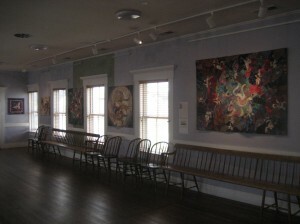 Nineteen pieces were hung in the show and five of them were new. Quite an achievement for me as my production these days is not what it once was. Not only are there lots of distractions here in Greensboro, but I can’t sit for hours at the machine! I find as I get older I have to spend a significant amount of my time on body maintenance–walking, exercise class, relaxation and meditation–not to mention doctor’s visits and weekly therapy sessions. It sure does add up and leaves less creative time. So the five pieces represent a lot of discipline and focus on my part. Riverarts is a very old building and has been carefully restored. 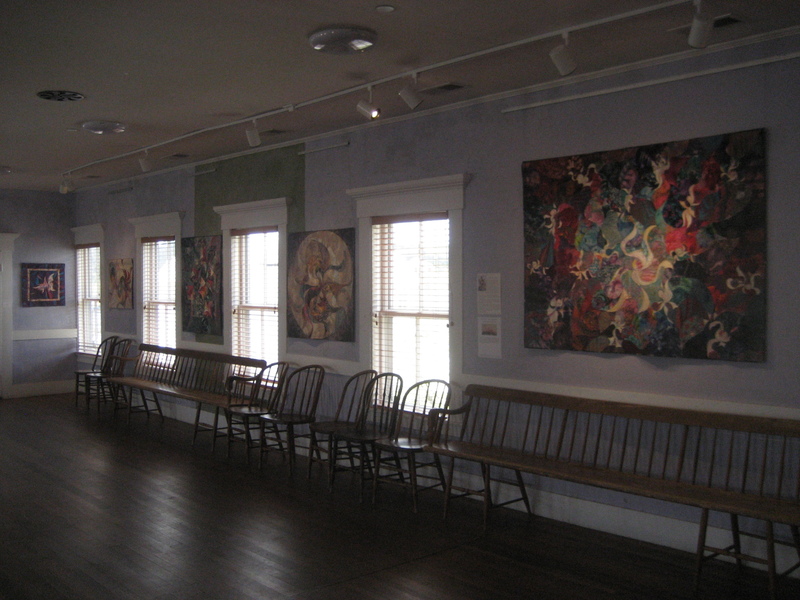 As you can see from the photo, there are lots of windows in the gallery and the walls are painted a lavender color, which might have been problamatic, but wasn’t. 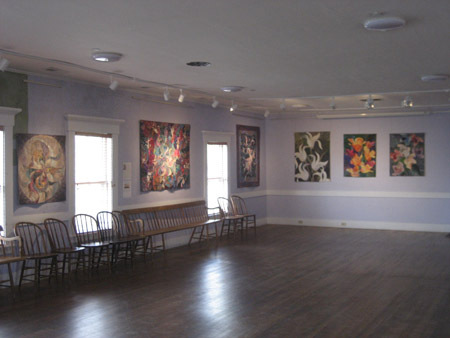 My work looked great on the lavender walls, and the windows divided the space nicely, creating a distinct space for each piece. Forunately I had many pieces that were just the right size to fit in between the windows. There were also larger spaces for some of my bigger pieces. It is always impressive to see all the work together, hung nicely and lit properly. 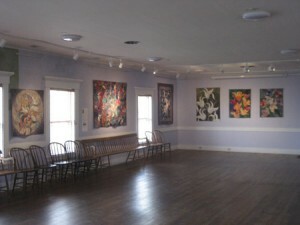 The curator for my show was Paul Gruhler and he and I hung the show together, and he did the lighting. He’s a professional and really knows how to direct the lights to highlight the various pieces. When you entered the room you could see almost the whole show and it looked mighty impressive, if I do say so myself!! I tend to treat my work fairly casually when it’s at home with me, so it’s always a thrill to see it looking so impressive in a beautiful setting like RiverArts! Here’s another view…….